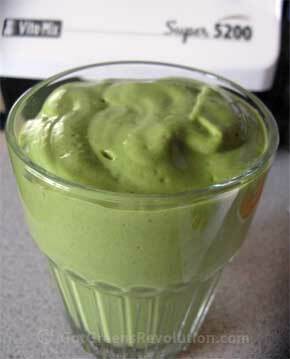 Avocado Tahini Green Smoothie - Got Greens? We had another big hit today with our green smoothie! We wanted something other than the standard fruit smoothie with greens today, something with more go fat for this cold fall morning. While fruit and greens are perfect for food combining, there are other options. That’s the greatest thing about greens – they can combine with anything. Starting with a half an avocado and a scoop of Raw Tahini, I knew I was going in the right direction. Once again I was awarded with the “This is too yummy to share” award! Blend it up and enjoy! Makes about 2 12 once servings. Try this and tell us what you think!